Get an accurate measurement of the radius without the hassle of making metal or cardboard arcs, then adjust the arc accordingly. It is now possible to measure the curvature of an arc quickly, easily, accurately and inexpensively. Instantly measure anything from hand-railing, to front-end loader buckets to door-way arches. Measures radii ranging from 6"(150mm) to 144"(3600mm) in Metric and Imperial, from the Inside. Ideal for construction workers, welder-fabricators, hobbyists etc. to take a quick and easy measurement in the field to help describe an arc and putting it down on paper. Taking a radius measurement and then measuring the arc-length would be all the information required to take back to the shop. Need a smaller version? Check out the IRG 750. Used where straight lines are few and far between, the ARC MASTER Radius Gauge weighing in at only 12 oz., will be an indispensable addition to anyone's tool kit. A sensible low-tech solution to a high-tech problem. Measures radii ranging from 6"(150mm) to 144"(3600mm) in Metric and Imperial, from the Outside. Need a smaller version? Check out the ORG 750. 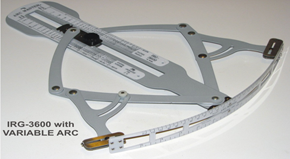 The VARIABLE ARC is a unique tool that, when mounted onto the RG 3600 radius gauges, will actually form the arc the radius gauge is set to. 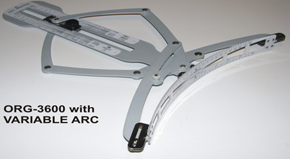 The Variable Arc is perfect for measuring arcs drawn on paper as is so often the case in metal or wood shops. 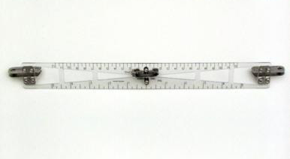 Also, because of the measuring capability of the Arc Master Radius Gauge, the Variable Arc is readily scaleable, ideal for use in drafting arcs. The ARC MASTER IRG-3600 and ORG-3600 along with the VARIABLE-ARC are designed and manufactured by Pivot Point Instruments. © 2012 Copyright by Arc Master. All rights reserved. Site developed by Click.Inspire Solutions | Unauthorized use of web content including images is prohibited.